Determining whether rinsing packaging is necessary depends on a few factors, including how much residue is left, what was in the container, and whether the closure even allows you to easily rinse the inside of the container? If you are making sure that every container is empty before recycling it, you’ve gone most of the way towards being an excellent recycler. Packaging that is still full or partially full is at high risk of being landfilled even if you place it in your recycling bin. You should compost any remaining crumbs or unused food products before recycling. Any package containing a lot of thick and sticky residue, like a jar of peanut butter or a tub of icing, should be rinsed. Any package containing soap (dishwasher detergent, shampoo, laundry detergent, hand soap, etc.) should not be rinsed. In fact, some plastic recyclers rely on residual soap to clean the plastics during reprocessing. After all, it is important to reduce, reuse, and recycle! Rinsing does not need to be perfect. Don’t worry about getting every single spot of residue off, because that uses a lot of water. 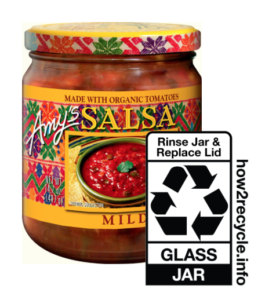 Just splash that salsa jar with a little water, replace the lid, and it’s ready to go. If the cap or lid isn’t easily removed for you to get inside it and rinse, don’t worry; just make sure the package is thoroughly empty before recycling.